A few very tough 'questions of conscience' are raised here. 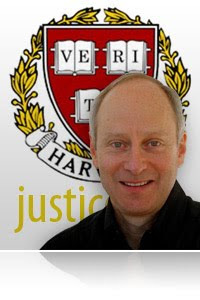 Harvard's Justice Michael Sandel ponders various scenarios to determine if murder could possibly ever be deemed to be 'morally right'. For example - Scenario 1: You are driving a trolley car and have lost the brakes. The trolley car is going to hit five workers on the track which will cause instant death to them all. You realize that the steering is working and you have the split-second opportunity to divert the trolley car onto a side track, however doing so will instantly kill just one worker who is standing on the side track. Do you turn the wheel and kill the one worker, or allow it to take out the five straight ahead? Next, a similar situation - this time you are standing by the track and see the out of control trolley car which is inevitably going to kill the five workers. In front of you is an overweight man - you realize that if you push the man into the path of the trolley car, you will kill him, but will save the lives of the other five - do you push him? Why would it be ok to turn the wheel to kill one to save five, but not ok to push someone to kill one to save five? Thanks to my good friend, Wang Jian Shuo for sharing this video - I found it very profound and extremely interesting to say the least.